Montana Test.com - Results for: Eureka Tetragon Tested! Eureka TETRAGON 2 person Tent! We received two Tetragon two person tents in early February for a high altitude camping excursion this coming spring and summer. These are 3 season tents and one of those does not include winter. With the elevation we will basecamp when we head for the mountains it is entirely possible to get both rainfall and snowfall .February was an ideal time for us to set up and let the weather show us what it can do. Jaremy Hamm set the other tent up in his backyard so we have two test sites to observe. 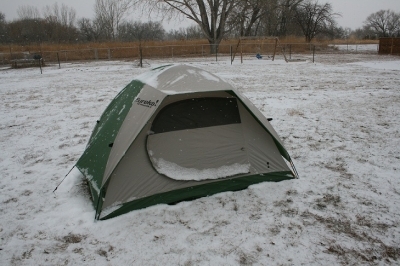 Update: The Tetragon was used by one of our testers on the Yellowstone River on a couple of overnight fishing outings. It worked out perfect and with limited room in all drift boats it packed out of the way. The Tetragon is a great little tent for two people, we like it. The fly features 2 fly rods that form a brim over the door for protection from the elements and to add strength and stability to the tent. The tent's free standing and shock corded fiberglass frame is lightweight and easy to set up. Clips secure the tent body to the frame. One side opening, twin track door, consisting of a no-see-um mesh panel and a fabric panel, allows flexibility for venting & insect protection. A zipper cover on the door provides protection from water. Two interior pockets keep essentials close at hand. Matching yellow webbing on tent & fly couple with the ring & pin assembly to make set up fast. Min Weight 5 lbs. 4 oz. Tent Area 35 sq. ft.
May be a bit heavy for the serious backpacker.